The transmission is the most difficult engine component to service. If you’re noticing any performance issues with your vehicle’s transmission, you should avoid trying to self-diagnose. London’s Automotive in Corvallis, OR has a team of ASE Certified techs that are well-trained and experienced with all manual and automatic transmission repairs. Get your transmission repairs from us first! Before we perform any auto service, we’ll provide a thorough diagnosis. It’s difficult to analyze your vehicle’s transmission because many problems can appear to be something else entirely. We know exactly how your transmission is supposed to perform. If you notice any transmission malfunctions like slipping out of gear, delayed acceleration, or rough gear shifting, bring your vehicle to our experts. With decades of auto service expertise, we make sure your transmission stays road-ready. Save yourself time and money by finding out the true condition of your transmission! Our technicians are well-trained and experienced in all transmission services and repairs. London’s Automotive has a team of experts ready to enhance your vehicle’s overall performance and handling. We provide clutch repairs for all makes and models of manual transmissions, as well as torque converter repairs for automatic transmissions. Keep your vehicle’s transmission performing at its best. As you accelerate and decelerate your vehicle’s gears should shift smoothly. We can return your vehicle’s transmission to its original condition and performance. Our differential services and repairs keep your vehicle stable around every corner. We use state-of-the-art tools and equipment to diagnose and fix any transmission problem. Before you receive an expensive transmission repair, let us have a look! Our experienced technicians can solve transmission performance problems with quality maintenance services instead of costly rebuilds, repairs, or replacements. The key to London’s exceptional transmission service is staying two steps ahead of any issue. London’s Automotive is your go-to auto service facility. 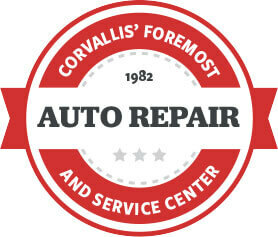 We keep Corvallis vehicles on the road and extend their road-life. Our transmission repairs will enhance your vehicle’s overall performance and your comfortable road travel. You have nothing to worry about when you come to our trustworthy facility. We’ve been providing our exceptional transmission service since 1982, and have been providing a competitive service guarantee–2 Years / 24,000 Mile Warranty. We’re the preferred local service destination over the expensive dealerships. At London’s, you get treated like family and your vehicle like one of our own. Give us a call today at 541-753-4444 to schedule your next transmission repair appointment. You can save time by using our convenient online scheduling system. Next time you’re in the area, feel free to stop on by to meet our experts. We gladly accept all of our walk-ins!